Felix's book of the week is Hop on Pop by Dr. Seuss. Hop on Pop is part of the Blue Back Books by Dr. Seuss; a range of books designed for parents to share with their children. Hop on Pop is a fun read and a great introduction to rhyming words, such as Hop and Pop, Cup and Pup, Ball and Wall, See and Bee. In time, Felix will learn that he can simply change the first letter to make a whole new word. Felix has been going through a phase of not wanting to read long books; we've been looking at a lot of picture books, just naming things and not reading the story. 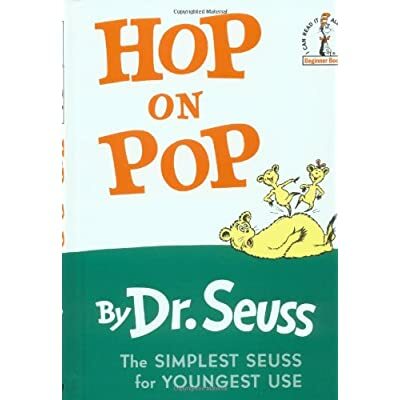 Hop on Pop was our reintroduction to reading. At 64 pages, it is a lengthy book and Felix did not sit through the entire thing straight away. It was on the fourth reading that we finally made it to the end. Since then we can happily read the book five times a day, sometimes more. At the moment, "No Pat No, Don't sit on that." with the strange yellow creature about to sit on a prickly cactus is Felix's favourite page. It never fails to elicit a giggle from him and sometimes a full belly laugh. The rhythm of Hop on Pop is lovely; it can be read normally, just like any other story or you can really embrace the rhythm and almost sing your way through the book. Do you own this book? I would love to hear what your children think of it and what their favourite parts are.